This past weekend, BHS students Cat Hoyt, Kristin Johnson, Mira Mehdi, and Kelsey O’Brien represented the Burlington High School Help Desk program and attended EduCon 2.7, one of the country’s most prestigious educational conferences, in Philadelphia, Pennsylvania. 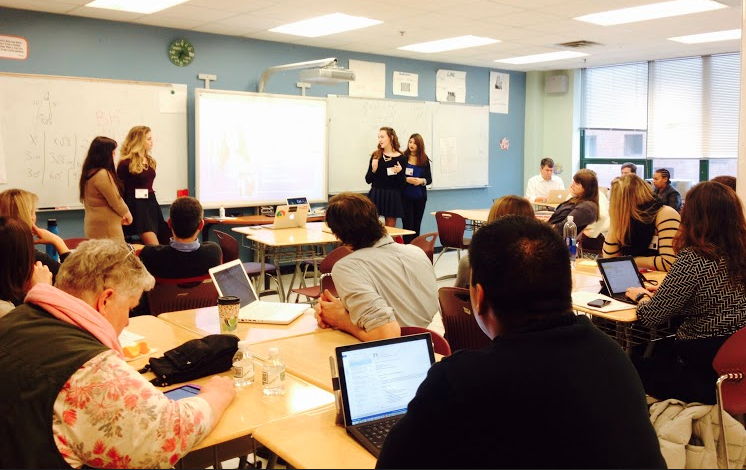 Shortly after presenting on Augmented Reality in the Classroom with Mira at the MassCUE conference back in October, I started thinking about submitting a proposal to lead a conversation at EduCon. Mira had done such a fantastic job leading at MassCUE that I decided I wanted to submit a conversation session proposal designed to amplify the voices of all four of my female Help Desk students. I ran the idea past the girls and fortunately they agreed to develop a conversation and make the trip down to Philadelphia. When I received word from Meeno Rami that our conversation was accepted, I was elated, as were my students. Mira, Cat, Kristin, and Kelsey, all seniors, facilitated a thought provoking conversation titled, “Closing the Innovation Gender Gap: Engaging Girls in STEM.” The purpose of the conversation was to dispel some of the myths associated with STEM and females; particularly that girls can’t handle the rigor of a STEM curriculum and that they lack the confidence, drive, and ambition to compete alongside their male classmates. We also discussed how K-12 educators can encourage more young women to enroll in STEM courses at the secondary level, declare a STEM related major, graduate with a degree and ultimately contribute their innovation to our workforce through pursuing a STEM based career path. As I reflect back on the conversation and the comments that we received from attendees, both face to face and on social media, it’s safe to say we accomplished our goal. 1. Why do we need STEM education? 2. Is there really a gender gap? If so, what are the causes of this gap? Where do we start if we want to close it? 3. What are the stereotypes associated with STEM? How are these perceptions impacting young women to pursue STEM? Attendees posted their answers to the questions we posed on a girls in STEM padlet wall which led to an even deeper discussion about the stereotypes of STEM careers and some of the challenges unique to women who wish to enter the field; most notably a lack of female role models in STEM. After about thirty minutes of conversation, the group reconvened and we spent time discussing the myths of STEM versus the realities, shared key statistics about the need for STEM education, and provided examples of how our Help Desk program allows students of both genders to put their STEM skills into practice in a real world situation. We ended the conversation by offering STEM resources, 11 specific strategies to recruit and support girls in STEM, and stressed the importance of providing girls with access to STEM related opportunities as early as possible. Throughout the presentation the girls spoke candidly about their personal experiences with STEM, both the successes and the challenges, and it was apparent our audience appreciated their sincerity and authenticity. 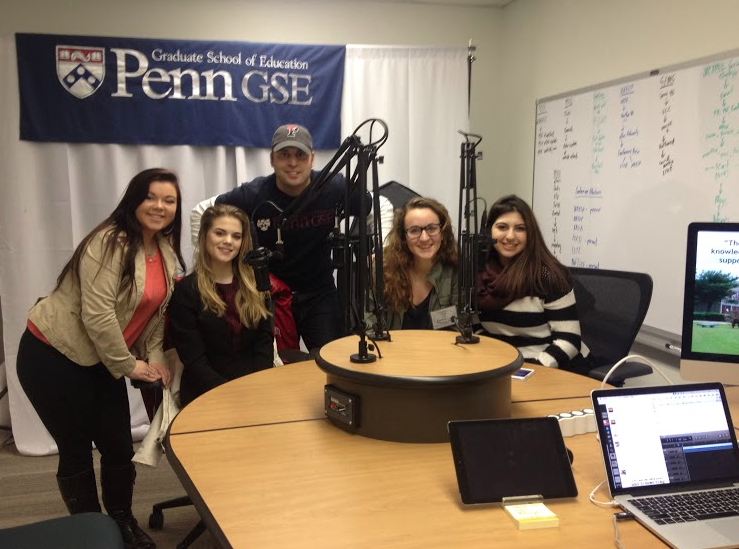 The voices of my female students were amplified even further when I was asked by Joe Mazza, a lead learner and member of my PLN who I first met via Twitter back in 2011 , to do a podcast for the University of Pennsylvania’s Graduate School of Education MC Innovations Lab. The girls agreed to talk with Joe and the entire podcast (which includes the girls singing the now famous “Techie Ladies” song) can be listened to here. My first EduCon experience far exceeded my expectations and once again it gives me great pride to showcase the incredible talents of Burlington students to a wide audience. 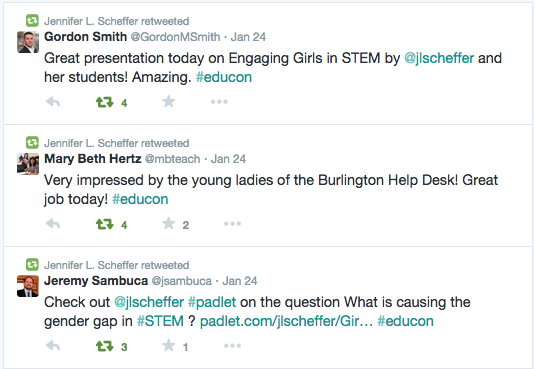 I’m proud their message resonated with so many educators and their ideas provoked a rich conversation. I look forward to possibly attending EduCon 2.8 next year and hopefully bringing another group of student geniuses to share about the teaching and learning being done in Burlington Public Schools. To learn more about Mira, Cat, Kristin, and Kelsey, you can take a look at the slides from our conversation which are shown below. Meet the Techie Ladies of BHS! ← VOTE BURLINGTON FOR THE FOLLETT CHALLENGE! I am so proud!! Great job! Thank you for taking the time to comment Faydeen! The girls did a great job!